Postmodernist icon Donald Barthelme (April 7, 1931–July 23, 1989) was not only one of the most innovative and memorable voices in twentieth-century fiction, known for his seemingly plotless verbal-collage narratives, but also a writer with a special sensitivity to language and an exceptional ability to articulate its magic. In his 1987 essay “Not-Knowing,” which became the title of the fantastic posthumous anthology Not-Knowing: The Essays and Interviews (public library), Barthelme explores an essential aspect of writing (and, for that matter, of all creative work), the uncomfortable but necessary skill that Keats famously termed “negative capability” — the capacity to rest in the unknown and the unresolved, using it as raw material for creative work. The writer is one who, embarking upon a task, does not know what to do. The problems that seem to me to define the writer’s task at this moment (to the extent that he has chosen them as his problems) are not of a kind that make for ease of communication, for work that rushes toward the reader with outflung arms — rather, they’re the reverse. Let me cite three such difficulties that I take to be important, all having to do with language. First, there is art’s own project … of restoring freshness to a much-handled language, essentially an effort toward finding a language in which making art is possible at all. This remains a ground theme, as potent, problematically, today as it was a century ago. Secondly, there is the political and social contamination of language by its use in manipulation of various kinds over time and the effort to find what might be called a “clean” language… Finally, there is the pressure on language from contemporary culture in the broadest sense — I mean our devouring commercial culture — which results in a double impoverishment: theft of complexity from the reader, theft of the reader from the writer. 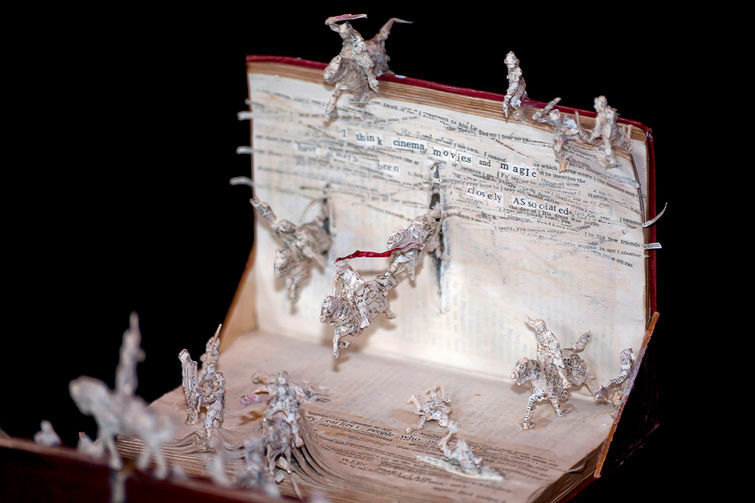 Sculpture by Jennifer Collier from ‘Art Made from Books.’ Click image for more. Art is not difficult because it wishes to be difficult, but because it wishes to be art. However much the writer might long to be, in his work, simple, honest, and straightforward, these virtues are no longer available to him. He discovers that in being simple, honest, and straightforward, nothing much happens: he speaks the speakable, whereas what we are looking for is the as-yet unspeakable, the as-yet unspoken. We have language deeply suspicious of its own behavior; although this suspicion is not different in kind from Hemingway’s noticing, early in the century, that words like honor, glory, and country were perjured, bought, the skepticism is far deeper now, and informed as well by the investigations of linguistic philosophers, structuralists, semioticians. Even conjunctions must be inspected carefully. “I read each word with the feeling appropriate to it,” says Wittgenstein. “The word ‘but’ for example with the but-feeling…” He is not wrong. Isn’t the but-feeling, as he calls it, already sending us headlong down a greased slide before we’ve had the time to contemplate the proposition it’s abutting? 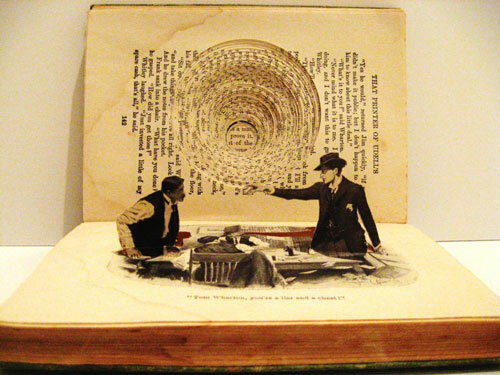 Sculpture by anonymous artist from ‘Art Made from Books.’ Click image for more. The earlier newspaper culture, which once dealt in a certain amount of nuance and zestful, highly literate burly-burly, has deteriorated shockingly. . . . Where once we could put spurious quotes in the paper and attribute them to Ambrose Bierce and be fairly sure that enough readers would get the joke to make the joke worthwhile, from the point of view of both reader and writer, no such common ground now exists. . . . When one adds the ferocious appropriation of high culture by commercial culture — it takes, by my estimate, about forty-five minutes for any given novelty in art to travel from the Mary Boone Gallery on West Broadway to the display windows of Henri Bendel on Fifty-seventh Street — one begins to appreciate the seductions of silence. If the writer is taken to be the work’s way of getting itself written, a sort of lightning rod for an accumulation of atmospheric disturbances, a St. Sebastian absorbing in his tattered breast the arrows of the zeitgeist, this changes not very much the traditional view of the artist. But it does license a very great deal of critical imperialism. There is, in [certain kinds] of criticism, an element of aggression that gives one pause. Deconstruction is an enterprise that announces its intentions with startling candor. Any work of art depends upon a complex series of interdependences. . . .
Modern-day critics speak of “recuperating” a text, suggesting an accelerated and possibly strenuous nursing back to health of a basically sickly text, very likely one that did not even know itself to be ill. I would argue that in the competing methodologies of contemporary criticism, many of them quite rich in implications, a sort of tyranny of great expectations obtains, a rage for final explanations, a refusal to allow a work that mystery which is essential to it. I hope I am not myself engaging in mystification if I say, not that the attempt should not be made, but that the mystery exists. I see no immediate way out of the paradox — tear a mystery to tatters and you have tatters, not mystery — I merely note it and pass on. 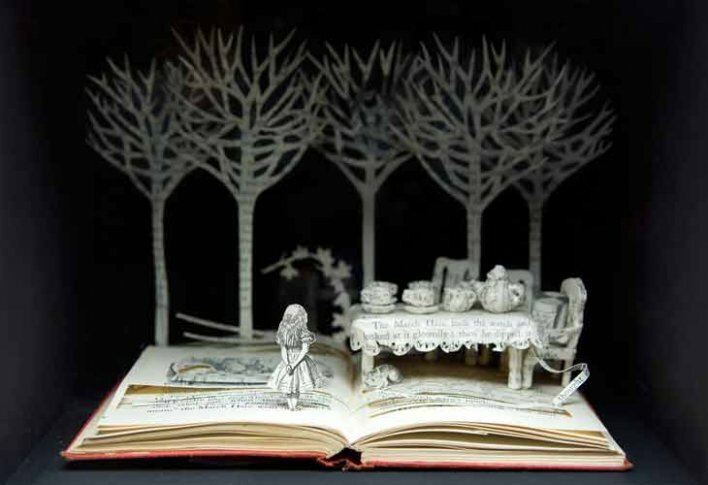 Sculpture by Su Blackwell from ‘Art Made from Books.’ Click image for more. Let us discuss the condition of my desk. It is messy, mildly messy. The messiness is both physical (coffee cups, cigarette ash) and spiritual (unpaid bills, unwritten novels). The emotional life of the man who sits at the desk is also messy — I am in love with a set of twins, Hilda and Heidi, and in a fit of enthusiasm I have joined the Bolivian army. The apartment in which the desk is located seems to have been sublet from Moonbeam McSwine. In the streets outside the apartment melting snow has revealed a choice assortment of decaying et cetera. Furthermore, the social organization of the country is untidy, the world’s situation in disarray. How do I render all this messiness, and if I succeed, what have I done? To render “messy” adequately, to the point that you are enabled to feel it — it should, ideally, frighten your shoes — I would have to be more graphic than the decorum of the occasion allows. . . . The combinatorial agility of words, the exponential generation of meaning once they’re allowed to go to bed together, allows the writer to surprise himself, makes art possible, reveals how much of Being we haven’t yet encountered. It could be argued that computers can do this sort of thing for us, with critic-computers monitoring their output. When computers learn how to make jokes, artists will be in serious trouble. But, artists will respond in such a way as to make art impossible for the computer. They will redefine art to take into account (that is, to exclude) technology — photography’s impact upon painting and painting’s brilliant response being a clear and comparatively recent example. The prior history of words is one of the aspects of language the world uses to smuggle itself into the work. If words can be contaminated by the world, they can also carry with them into the work trace elements of world which can be used in a positive sense. We must allow ourselves the advantages of our disadvantages. Style is not much a matter of choice. . . . Rather it is both a response to constraint and a seizing of opportunity. Very often a constraint is an opportunity. Art is always a meditation upon external reality rather than a representation of external reality or a jackleg attempt to “be” external reality. 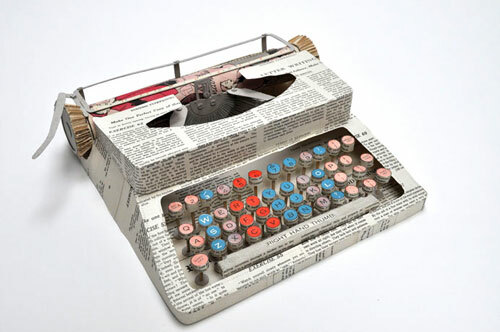 Sculpture by Jennifer Khoshbin from ‘Art Made from Books.’ Click image for more. Art is a true account of the activity of mind. Because consciousness … is always consciousness of something, art thinks ever of the world, cannot not think of the world, could not turn its back on the world even if it wished to. This does not mean that it’s going to be honest as a mailman; it’s more likely to appear as a drag queen. The problems I mentioned earlier, as well as others not taken up, enforce complexity. “We do not spend much time in front of a canvas whose intentions are plain,” writes Cioran. “Music of a specific character, unquestionable contours, exhausts our patience, the over-explicit poem seems incomprehensible.” Flannery O’Connor, an artist of the first rank, famously disliked anything that looked funny on the page, and her distaste has widely been taken as a tough-minded put-down of puerile experimentalism. But did she also dislike anything that looked funny on the wall? If so, a severe deprivation. Art cannot remain in one place. A certain amount of movement, up, down, across, even a gallop toward the past, is a necessary precondition. Style enables us to speak, to imagine again. Beckett speaks of “the long sonata of the dead” — where on earth did the word sonata come from, imposing as it does an orderly, even exalted design upon the most disorderly, distressing phenomenon known to us? The fact is not challenged, but understood, momentarily, in a new way. It’s our good fortune to be able to imagine alternative realities, other possibilities. We can quarrel with the world, constructively (no one alive has quarreled with the world more extensively or splendidly than Beckett). “Belief in progress,” says Baudelaire, “is a doctrine of idlers and Belgians.” Perhaps. But if I have anything unorthodox to offer here, it’s that I think art’s project is fundamentally meliorative. The aim of meditating about the world is finally to change the world. It is this meliorative aspect of literature that provides its ethical dimension. Not-Knowing: The Essays and Interviews is well worth a read in its entirety, spanning Barthelme’s equally mind-tickling meditations — sometimes irreverent, often ironic, and always insightful — of everything from literature and art to architecture and urbanism to film and pop culture.